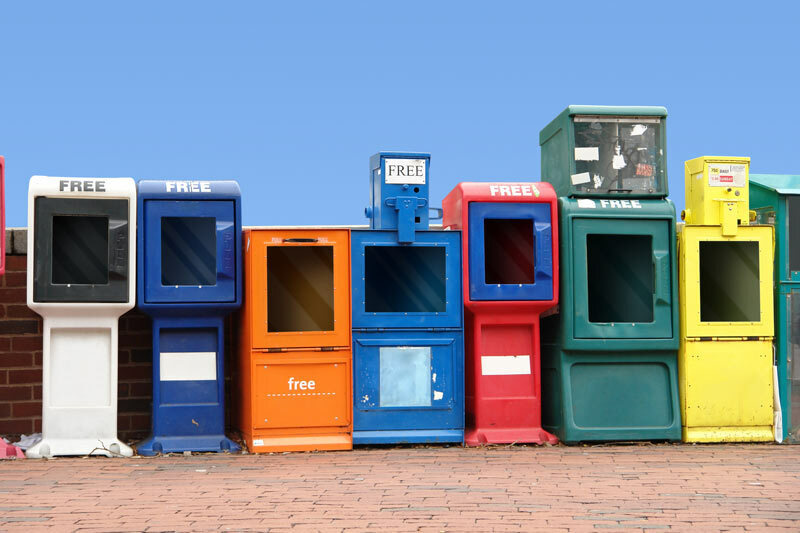 In July 2016, Metro Community Papers in WNY closed leaving small business owners, contractors and Metro Community News advertisers without cost-effective, local advertising solutions. Many are placing their ads in pricey publications with no results! Newspaper circulation has consistently fallen year after year and on-line digital advertising is falling short of expectations. Casting a wide net to reach potential customers seldom works – reach your customers in a targeted, planned and effective manner using Every Door Direct Mail or targeted Bulk Mail. 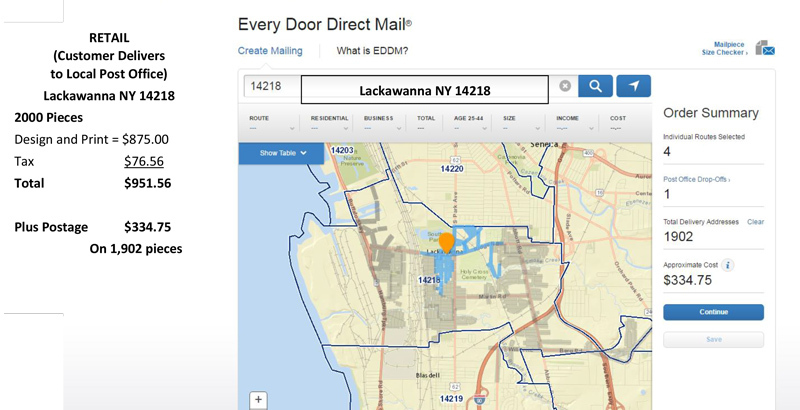 Using Every Door Direct Mail, you can target delivery by zip code or specific postal routes. 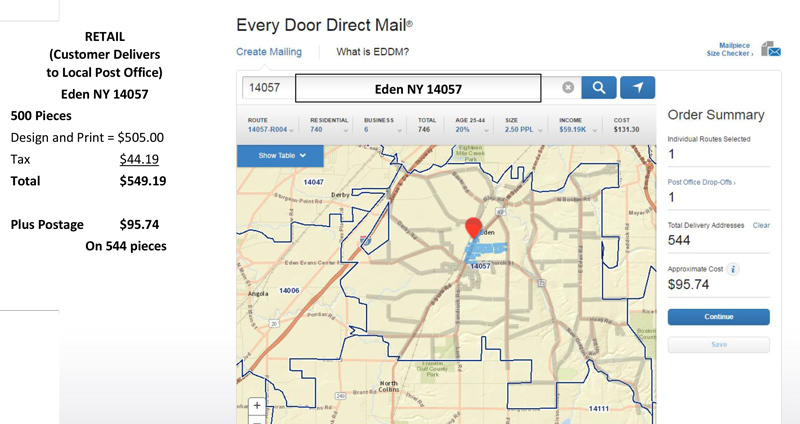 You can view all of the routes at USPS.com and plan your mailing based on location, median age and household income. Discover your postage costs immediately to help plan your budget. Every Door Direct Mail and Presorted Bulk Mail have surpassed Stamped First Class mail at the United States Post Office for the last 11 years. "In 2005, the volume of Standard (Advertising) Mail surpassed the volume of the Postal Service’s flagship product, First-Class Mail, for the first time." 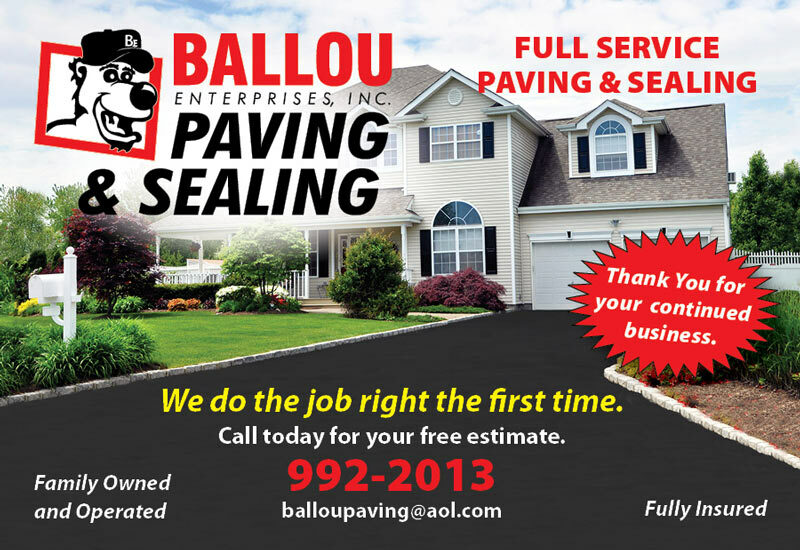 "Ballou Paving & Sealing has used Evenhouse Printing for the past few years to mail out our yearly postcards. They were so amazing to work with!! They provided us with options for the design of the postcard and were very helpful with the wording we use on the mailings...We have had such a positive response from our customers, that we wish we would have done this sooner!" At Evenhouse Printing, we have proven to ourselves and for many customers the value of Every Door Direct and Bulk Mail to reach a targeted customer base. Customers have given us direct feedback on the value they received using Every Door Direct Mail and Bulk Mail campaigns. The majority of our mailing customers work with us monthly, quarterly and annually to send their message. Call Robin Evenhouse at Evenhouse Printing at 716-649-2666 for more information. Evenhouse Printing is family owned and operated - we are located in Hamburg, NY. 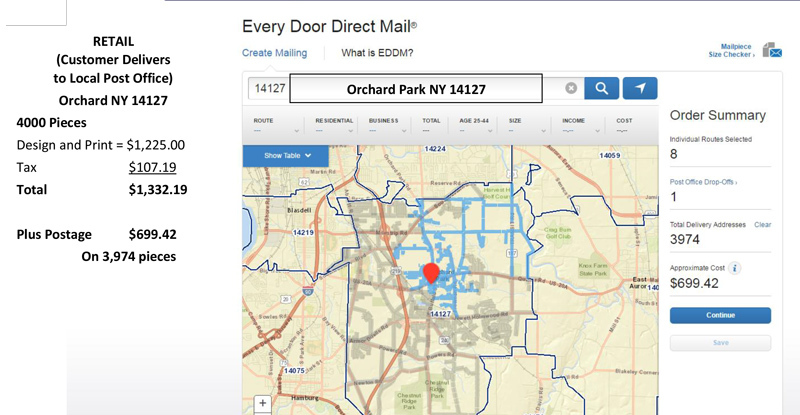 A sample mailing route map for an Every Door Direct Mail campaign in Orchard Park, NY. 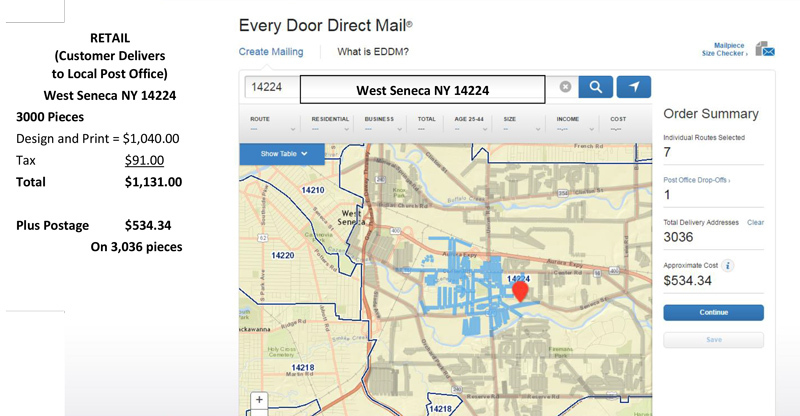 Mailing Routes can be customized by zipcode, population, median age, income and more. 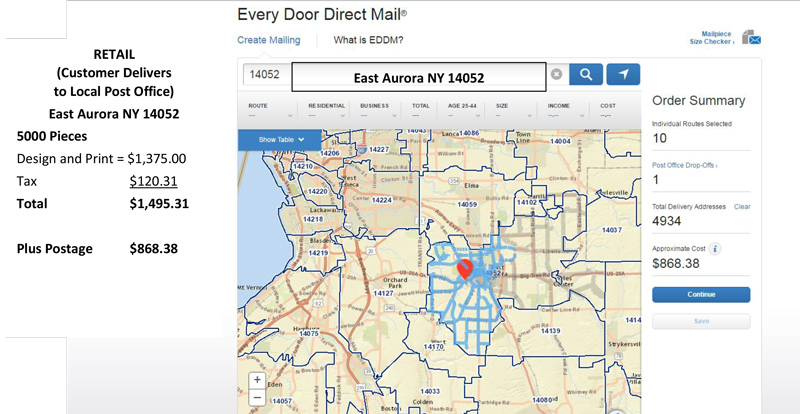 Evenhouse Printing can help you find the best mailing routes for you business. 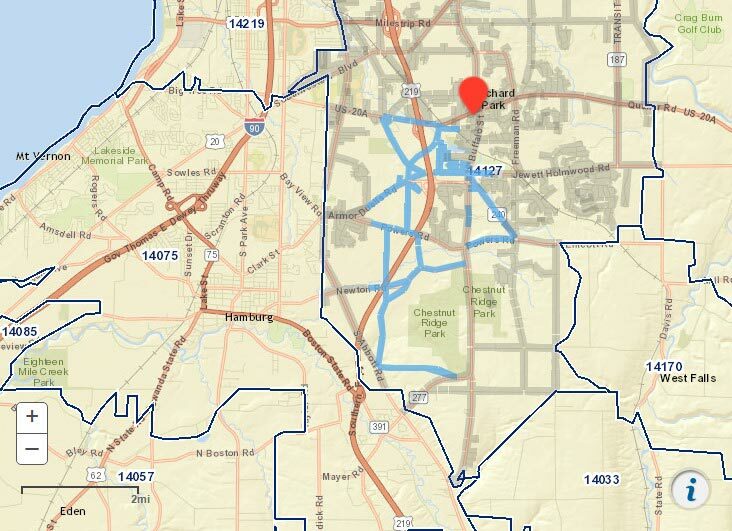 Below are some sample routes for a business advertising in Orchard Park, NY. Pricing includes high Quality design work, print full color on both sides on gloss or matte cover stock and measure 6.125 x 11 inches (including bleed). They are also bundled in 50's for easy drop off to the post office. This is solid pricing on our 6.125 x 11 inch post cards - not bait and switch. Pricing can be reduced by using less colors or can be increased by using larger sizes. Must use complete mailing route. Each home or business on route gets a postcard. No names or addresses needed. One of these dimensions must be fulfilled: Length must be greater than 10.5", or Height must be greater than 6.125"
Processing of databases and personalization (Variable Printing) is an additional charge. 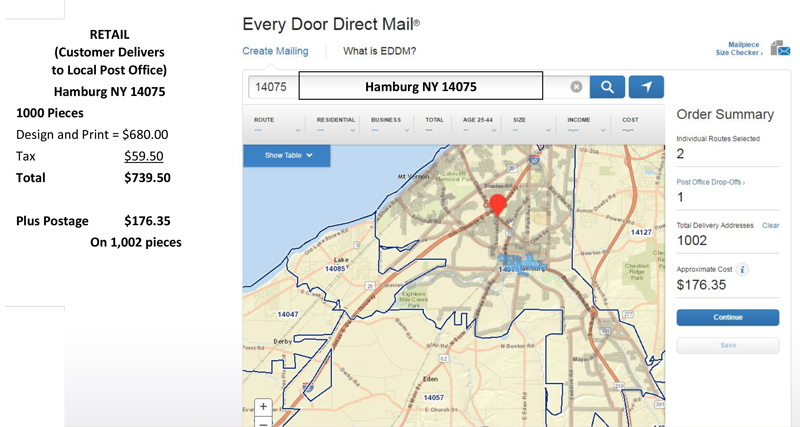 Minimum height size 3.5" up to 6" and Minimum width is 5" up to 11.5"
Talk to Robin at Evenhouse Printing at 716-649-2666 about starting an Every Door Direct Mail or Bulk Mail campaign today.